Please note that for ChIP DNA library construction we now recommend the NEBNext® Ultra™ II DNA Library Prep Kit (NEB #E7645). 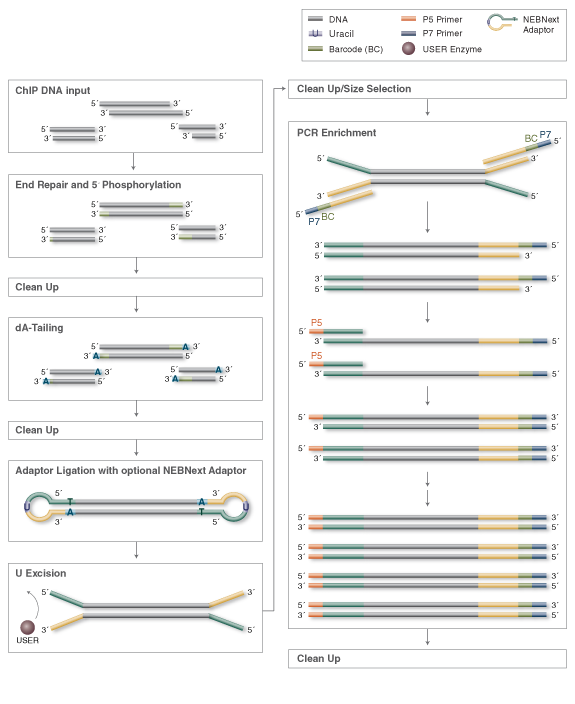 The NEBNext ChIP-Seq Library Prep Kit for Illumina® utilizes the original standard library prep workflow, which is longer than the NEBNext Ultra II DNA Library Prep Kit workflow, has more components, requires more clean-up steps and higher input amounts. The NEBNext ChIP-Seq Library Prep Master Mix Set for Illumina contains reagents for preparation of libraries for next-generation sequencing on the Illumina platform from 10 ng of ChIP DNA, in a standard workflow. Please note that adaptors and primers are not included in the kit and are available separately. Notice to Customer: Phusion® DNA Polymerase was developed by Finnzymes Oy, now a part of Thermo Fisher Scientific. Notice to Customer: Limited License. The purchase price of this product includes a limited, non-transferable license under U.S. and foreign patents owned by Bio-Rad Laboratories, Inc., to use this product. No other license under these patents is conveyed expressly or by implication to the purchaser by the purchase of this product. This product is licensed from Bio-Rad Laboratories, Inc. under U.S. Pat. Nos. 6,627,424, 7,541,170, 7,670,808, 7,666,645 and corresponding patents in other countries for use only in: (a) standard (non-real time) PCR in the research field only, but not real time PCR or digital PCR; (b) any in vitro diagnostics application, except for applications using real time or digital PCR; and (c) any non-PCR applications in DNA sequencing, isothermal amplification and the production of synthetic DNA.